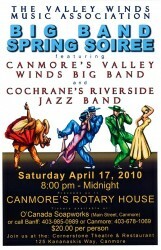 Head to the Cornerstone Theater and Restaurant in Canmore Saturday, April 17, for the Big Band Spring Soiree! Valley Winds Big Band shares the stage with Riverside Jazz to put on a night of dancing to swing, jazz, rock and more. The doors open at 8pm and the music goes non-stop from 8pm to midnight. 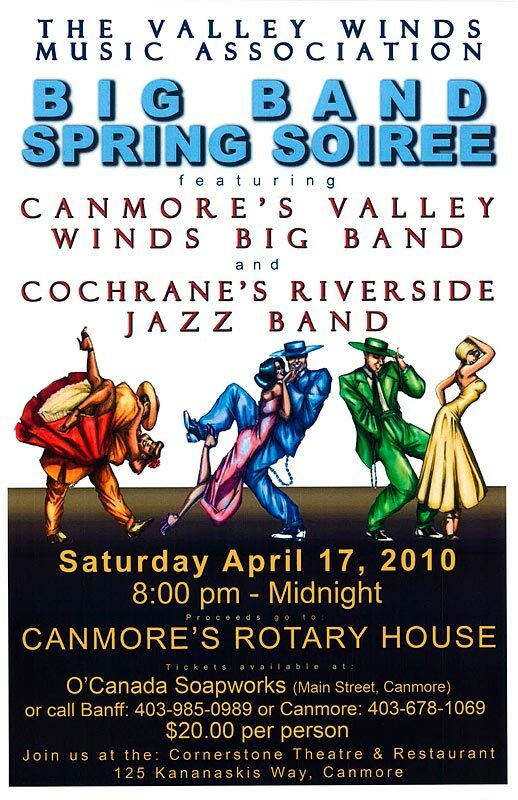 Tickets are only $20 and all proceeds will be donated to Canmore’s Rotary House. Tickets are available by phoning (403) 678-1069 (Canmore) or (403) 985-0989 (Banff) or fill in the form below and we will contact you. And if you love listening and dancing to Big Band Music, you’ll also want to check out Riverside Jazz’s own Big Band Dance June 5th in Cochrane!